LATHEM TIME COPROATION AZTY08997 - Excellent Quality. Great Gift Idea. Package Quantity: 1. Lathem time company e16 Tru-Align Time Cards Accounting Books. Sheet size - 4 lathem time company e16 Tru-Align Time Cards Accounting Books. Features. Sheet size - 4. Signature line. 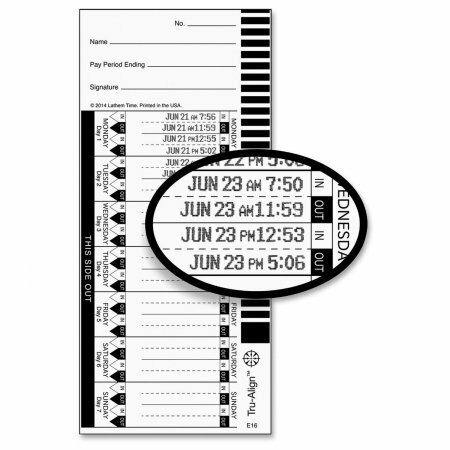 Pack of 100 weekly time cards; 125# white tag stock. For use with lathem' s new 1600E time clock. Since 1919, lathem' s singular focus has been to manufacture innovative, durable and affordable employee time and attendance systems. Monday - sunday Day 1 - Day 7.